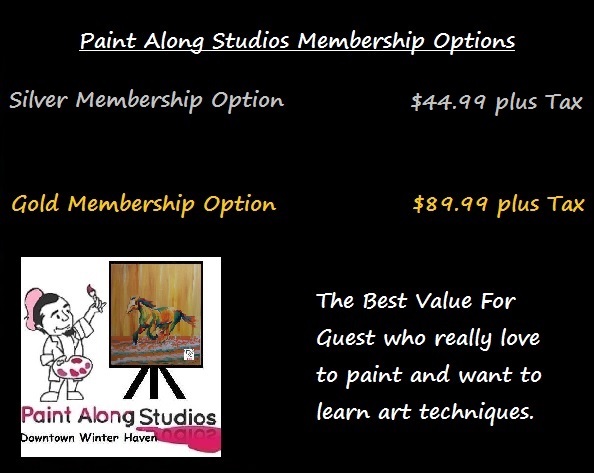 Paint Along Memberships The Best Art Class Value anywhere. Memberships are perfect for guest who wish to learn how to paint by attending several of our classes or simply want to frequent Paint Along Studios and STREEETCH their Entertainment Dollar. Best of all, you never sacrifice Quality. An Award Winning Artist teaches you classes. This means the more you paint, the more you will learn. Paint Along Studios makes Art Entertainment, it is at the center of what we do. Our diverse classes will teach you to master REAL art concepts, from proper brush strokes, to sea and landscape mastery- through techniques that will always transfer to your personal development. Overpaying is just twisted. Paint More. Pay Less. Paint Along Studios Today! Check out the full benefits of Paint Along Memberships below. Membership is valid for a full year from date of purchase giving you plenty of choices. The discount is Valid for up to 10 Classes. Valid toward any regularly priced adult class normally Wednesday, Thursday, Friday, and Saturday. Excludes Special Event Classes. Membership is non-transferable and valid only for one Guest. Registering name will activate membership. You will be emailed with all details. The discount is Valid for up to 20 Classes. You will receive a 12% off code to share with friends and family. Great to opportunity to invite your friends to paint with you. Code can be used for up to 20 seats. Valid toward any regularly priced adult class normally Wednesday, Thursday, Friday, and Saturday. Excludes Special EVENT Classes. Membership is non-transferable and valid only for one Guest. Name Required of guest before membership will be issued. You will be emailed with all details. are exclusive and non-transferable. One Person per membership. Reduction price does NOT INCLUDED TAXES. Remember, Sales tax added during every transaction. You Can only use your membership to register for one seat to one class per transaction. Management will void all violations. Repeat offenders will have membership voided without refund. NO REFUNDS Or CREDITS will be issued at any time for any reason, including termination of your membership for repeat offenses. All Sales Are Final. Membership benefits will expire after 1 year even if you did not attend 20 classes. Regular Class Cancellation Policy still applies to membership level purchases as well. Again you can only sign up for 1 seat for 1 class at a time when using your membership rewards code.